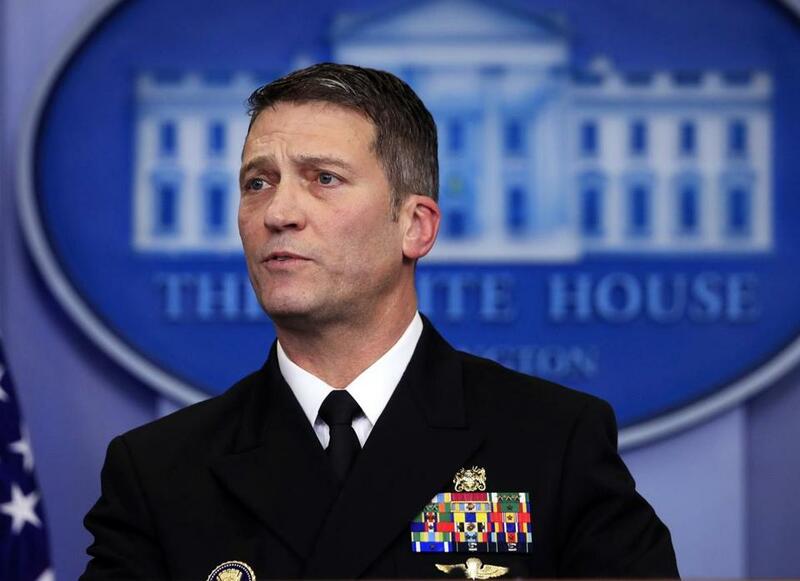 WASHINGTON — President Donald Trump’s overall health ‘‘is excellent’’ and he did ‘‘exceedingly well’’ on cognitive screening, the Navy doctor who performed Trump’s first medical checkup said Tuesday. Ronny Jackson had issued a blanket declaration that Trump was in ‘‘excellent health’’ after last Friday’s exam, and promised to provide a fuller readout on Tuesday. He reported that the 6-foot-3 president weighed in at 239 pounds — three pounds heavier than he was in September 2016, the last time Trump revealed his weight to the public. Trump was 70 when he took office on Jan. 20, 2017, making him the oldest person ever elected to the presidency. 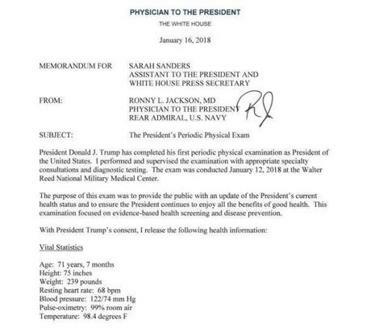 The following is the report from President Trump’s physical exam, which was performed last week. Trump’s heart exam was normal, with regular rhythm and no abnormal sounds, which Jackson said led him to conclude with confidence that Trump ‘‘has a very strong and a very probable possibility of making it completely through his presidency with no medical issues.’’ Trump has no heart disease and no family history of it. The 71-year-old president performed ‘‘exceedingly well’’ on cognitive screening, which is not standard but was requested by Trump. The doctor said he had ‘‘absolutely no concerns’’ about Trump’s cognitive abilities. He speculated that Trump requested the exam in an attempt to beat back the narrative of the past few weeks that he is mentally unfit for office. Trump last revealed details about his health two months before the November 2016 election. Trump’s cholesterol reading from Friday’s exam was borderline high even though he takes a low dose of the statin drug Crestor. Jackson said he would increase that dose in an effort to get Trump’s so-called ‘‘bad’’ cholesterol, or LDL level, below 120; it currently is 143. Trump’s body mass index, or BMI, of 29.9 puts him in the category of being overweight for his height. A BMI of 30 and over is considered obese. Jackson said he prescribed a diet lower in fat and carbohydrates, and exercise. He'd like the president to lose 10 to 15 pounds over the next year. Despite the diet and cholesterol concerns, Jackson stressed that Trump’s ‘‘cardiac health is excellent.’’ He passed a battery of heart exams including a stress test that Jackson said showed an above-average exercise capacity for a man of his age, despite some calcium buildup in his arteries. He also takes a low-dose aspirin for heart health. Trump did not undergo a psychiatric exam. But in a surprise, Jackson said he did perform a cognitive screening test, at Trump’s request. Called the Montreal Cognitive Assessment, it is designed to detect early signs of memory loss and other neurologic functions — and Trump had a perfect score. Cognitive assessments aren’t routine in standard physicals, although they recently became covered in Medicare’s annual wellness visits for seniors.